Do you want to tackle a home improvement project but don't know where to start and are having a hard time picturing what you want? With Home & Landscape Design, it's easy and fun to plan your next home design or landscaping project. Visualize your remodeling or decorating projects before you start! This will save you time and money in the long run. The QuickStart feature allows you to drag and drop rooms into place, size to the appropriate dimensions, and automatically build a roof. Quickly add detail to your design with Drag and drop landscape gardens and pre-created furniture groupings. Drag and drop floor and wall coverings, countertop materials, carpet, trim and more using the new SmartWand technology; apply to a surface or through the whole house with a mouse click. This new version 17.5 has an enhanced decorating library including over 300 new 3D furnishings objects. Other 3D improvements allow you to drag and drop 3D objects and plants directly into 3D and the easier menu access to project setup, recent projects, sample plans, and training materials makes designing a snap. Tackling a home project and staying on budget doesn't have to be difficult. Instantly get quantities for your painting, wall coverings, updated flooring and more. This helps you estimate your costs and makes your project a success! The fun way to plan your next home design or landscaping project. 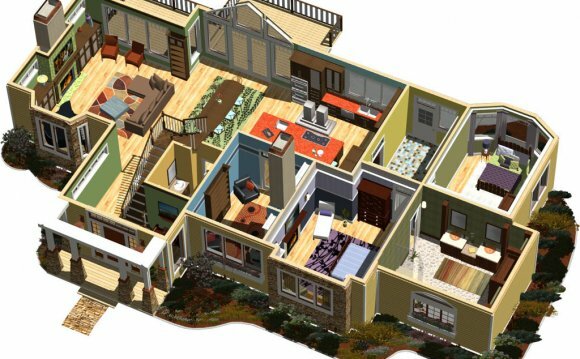 Visualize your remodeling or decorating projects before you start! Design your spaces the easy way! The QuickStart feature allows you to drag and drop rooms into place, size to the appropriate dimensions, and automatically build a roof. Quickly add detail to your design with Drag and drop landscape gardens and pre-created furniture groupings. Drag and drop floor and wall coverings, countertop materials, carpet, trim and more using the new SmartWand technology; apply to a surface or through the whole house with a mouse click. Landscape your plan and view it years later with the Grow feature. No experience required!